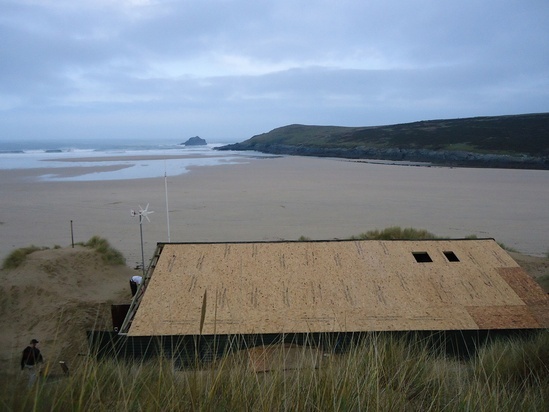 The corrugated roof of Crantock Surf Lifesaving Club’s clubhouse had deteriorated and was letting in increasing quantities of water and sand. The Newquay branch of builders’ merchant Travis Perkins and wood panel products manufacturer, Norbord together with the roof membrane manufacturer IKO donated material for a new roof while the club mobilised its members to provide labour and tools. Norbord provided 60 sheets of its 18 mm Sterling OSB as the principal sheathing material for the pitched roof. Because of the location, which is exposed to high levels of salt-laden spray blowing in from the Atlantic Ocean, Norbord suggested its OSB 3 grade, a precision engineered board designed for use in humid conditions. “All the materials were donated, which was a life-saver for us” says club member Lewis Timson, who co-ordinated the re-roofing project. “We held a number of fund-raising barbecues and other events to help pay for equipment hire and other services, but most of the labour was done by club members” he says. The lack of ready funds meant the project had to be done over two winters, with the front pitch (the most badly affected) re-roofed in 2009/10 and the rear pitch completed in 2010/11. Re-roofing the rear of the building was complicated by the fact that the original roof was in two sections, the rear-most being almost flat. “We had to rip all the timbers down and reconstruct it as a single pitch” explains Mr Timson. 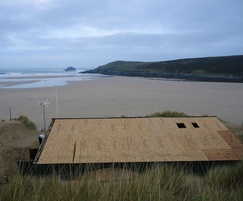 With the roof completed, Crantock Surf Lifesaving Club has a clubhouse capable of withstanding the rigours of the Atlantic Coast.